John Matthews, originally from California, retired to Bella Vista from Shreveport, Louisiana, January 1, 2015, with his wife Dru (short for Drucilla.) He holds a B.A. in Vocal Performance and an M.M. in Conducting. As a baritone soloist, John has performed over 130 roles with opera, symphony and theater companies all over the United States, Europe and Asia. As a conductor, John is currently the Music Director of the Bella Vista Men's Chorus, a position he’s held since March 2015. He is also the Director of Music Ministries of Highlands United Methodist Church in Bella Vista. 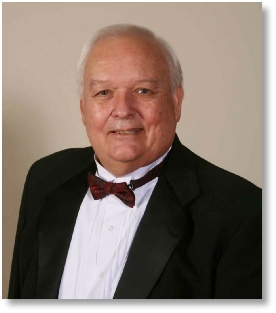 Mr. Matthews was Music Director of the Shreveport Choral Ensemble for 26 years, the Artistic Director/Conductor of the Shreveport Gilbert and Sullivan Society for 15 years, the Director of the River Cities Jubilee Barbershop Chorus for 14 years and Director of Music for Presbyterian and Methodist churches in the greater Shreveport area from 1986-2014. John was also the music director for many of Shreveport’s Centenary College theatrical music productions from 1995-2010. He also had a voice studio for 25 years. In his spare time, should he get any, John loves to play bridge, golf and dabble in antiques and collectibles with his wife.